THE SITE Located on the eastern edge of Trafford Park, this is an important gateway site and a pioneering development on the Trafford side of Salford Quays. The proximity to the Quays is a great asset to the scheme which focusses the public realm towards the waterfront. The site also boasts a pair of imposing ‘Skyhook’ sculptures designed by artist Brian Fell, which have been incorporated into the proposals. THE APPROACH The proposed landscape will become a vibrant and dynamic living environment for the residents of the development and the wider public. 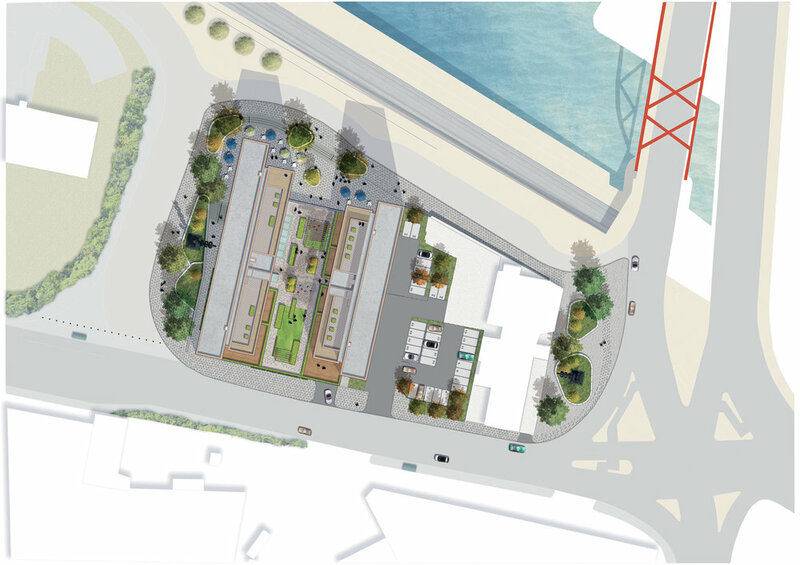 The design approach has been to extend the scope of the public realm beyond the immediate vicinity of the building to include the area around the eastern ‘Skyhook’. This will create a sense of continuity and breathe new life into the streetscape. The paving and planting will act as a unifying elements. Additionally the scheme includes a communal podium garden and roof terraces, designed to make the most of the sunny aspect and scenic views of the Quays.